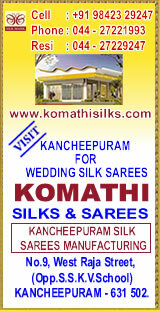 The Kanchipuram Silk Sarees are famous across the globe. 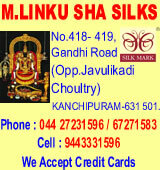 The glamour of the Kanchipuram silk sarees is in its colour contrasts. 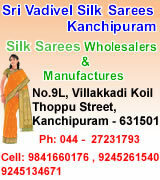 Temple borders, checks, stripes and floral (buttas) are traditional designs you will find in Kanchipuram sarees. 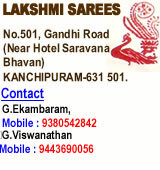 In a genuine Kanchipuram Silk Sarees, body and border are woven separately and then interlocked together. 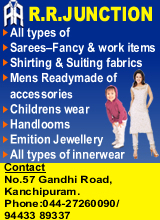 The joint is woven so strongly that even if the sarees tears, the border will not detach. 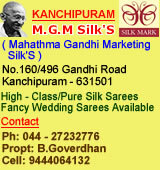 Kanchipuram silk sarees are amongst the most superior silks in the world. 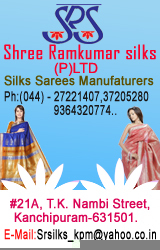 Thanks to its double warp and double weft. 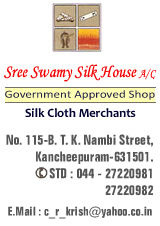 This enhances the beauty and the value of the silk. 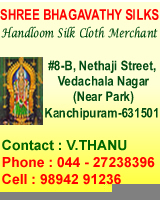 Kanchipuram Sarees are also known as Kancheepuram sarees, Kancheevaram sarees and sometimes Kanchivaram Sarees. 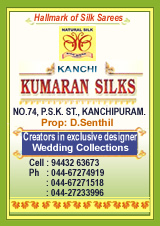 We provide the list of Silk Sarees in Kanchipuram and also you can get the complete contact details for Kanchipuram Silk Sarees. 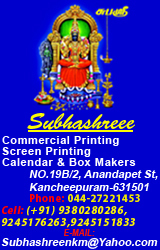 Mobile : 94437 22677 , 94432 21774. 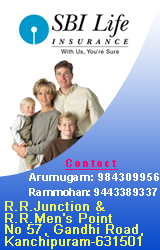 Resi. 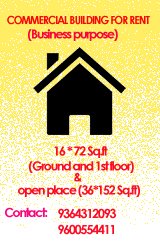 : N0.128, Sammandar Street, Appavoo Nagar, Orikkai. 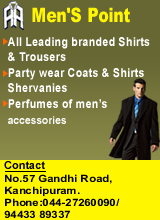 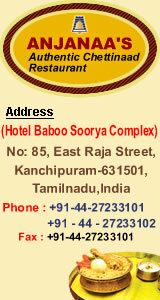 Old No.457, New No.218, Gandhi road, Kanchipuram - 631 501.